My most requested dessert is this brownie trifle with toffee bits and it all started at a fantasy football draft party. There’s something so eye pleasing about a chocolate layered dessert. Ever since that very first time I brought this trifle to a fantasy football draft, it became a tradition. 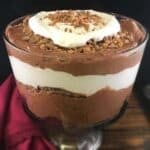 Also referred to as death by chocolate trifle, everyone wanted and expected me to bring this decadent chocolate dessert to the draft party every single year! There was never a drop left over! It’s really an easy dessert to put together. You can make and bake your own brownies. This recipe uses the family size brownie mix in a box. However, it’s perfectly fine to buy the pre-made brownie bites available at your local grocery store. The hardest part is not wanting to “sample” the brownies while assembling the trifle, which we do every single time. It’s so hard to resist brownies when they’re right in front of you. So go ahead and have a taste because it won’t matter and you’ll be glad you did. HaHa! 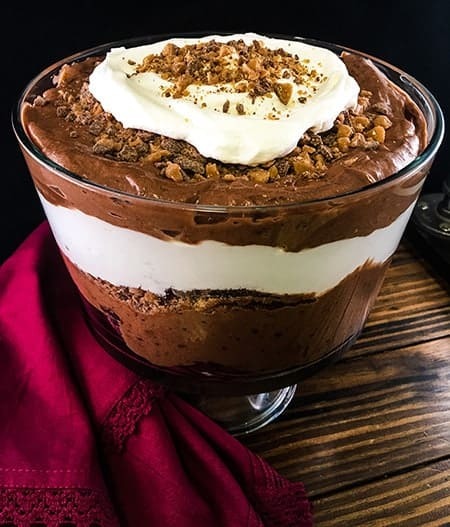 It’s really just a matter of making the chocolate pudding and layering it with the brownies, cool whip, and toffee bits in a trifle bowl. Trifle bowls are usually easy to find in most stores that sell kitchen goods. I like this trifle bowl from Anchor Hocking; it must be at least 15 years old. You can buy heath bar toffee bits and pieces in a bag. 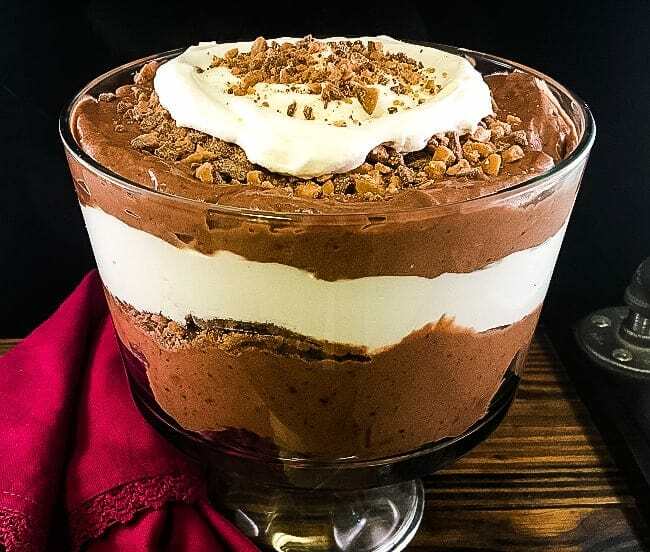 When I first made this trifle, many years ago, I actually bought the health bar candy bars and put them in a plastic bag and pounded them with a hammer to get the bits and pieces. Now, you can buy them pre-chopped. Actually, you can use your favorite candy such as m&ms, peanut butter cups, etc. You can’t go wrong with your favorite candy. This recipe uses instant chocolate pudding mix and whole milk. Use a whisk to mix for about 2 minutes and then fold in the cool whip. Folding in the cool whip is a much gentler mixing technique than whisking or beating. Also, it helps to keep the cool whip nice and fluffy. Use a spatula or spoon to fold in the cool whip. If it’s a holiday like Halloween, you can use candy corn as a topping. If it’s Christmas, you can use the red and green m&ms. For Valentines Day, use the candy hearts. I’m not a creative person, but THIS I can handle! Once you have all the layers complete, cover with plastic wrap and refrigerate for at least a couple of hours. Overnight seems to work a little better, but it’s not mandatory. This is truly the best dessert because it’s chocolately, pretty, delicious, crowd pleasing, versatile, and most of all EASY! Layered cubed brownies, bits of toffee, chocolate pudding, and cool whip. Most excellent dessert! Pour the brownie mix into a large mixing bowl, add the milk chocolate chips to the brownie mix, and bake according to the directions on the box. Best to use a 9x13 pan and bake for about 25 minutes. Cool and then cut into 1-inch squares. In a large bowl, blend the pudding mix and the milk for about 2 minutes. A wire whisk works well for this step. Then fold in about 3 cups of cool whip. Begin to layer about 1/2 the brownies in the bottom of a large trifle bowl, half of the pudding mixture, about 1/2 cup toffee bits and pieces, and a layer of cool whip. Repeat with another layer. Top with remaining toffee bits and pieces. Add additional candy toppings, if desired. Cover and store in the refrigerator at least overnight. If you try this trifle recipe, please let me know what you think. I’d love to hear from you!